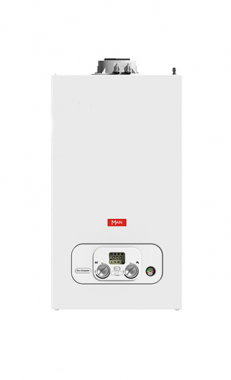 The Eco Compact 18kW System Gas Boiler is a highly reliable condensing wall mounted unit. Designed and manufactured by Main, the Eco Compact is compact in size which means that it can fit in a cupboard to help you save some valuable space in your home. Thanks to its compact size, it’s also lightweight, which makes the installation quick and easy, helping you to save time and money from the start. With an efficiency rating of 93% and ErP A rating for heating and hot water, this is a highly efficient unit that will help you to save money on your energy bills. Its output rating of 18kW makes it the perfect size for smaller homes with 1 bathroom. The range also includes a 15kW boiler and the option of a Combi or System unit, another great way to help make sure there is a boiler to suit the heating demands of more homes. The Eco Compact is fully compliant with Boiler Plus, has been endorsed by the Energy Saving Trust and has a class rating of 5 for its low NOx emissions, which is as good as it can get. The boiler features a brass hydraulics block, top central flue, optional standoff frame, front access to all components and user-friendly controls which make it easy to use the boiler, giving you maximum control. Available with a 5-year parts and labour warranty as standard, you’ll have peace of mind long after the installation.